​ ​LUBBOCK – The Buddy Holly Hall of Performing Arts and Sciences will serve as a catalytic project for downtown redevelopment when it opens in 2020. The namesake hails from Lubbock itself, and the 200,000-sf facility is expected to have a dramatic impact on the entire area. The $153 million project will create close to 1,200 jobs from construction efforts alone and host an estimated 250,000 visitors annually. Located in the heart of downtown, the 2,200-seat hall is easily accessible from the Marsha Sharp Fwy. and I-27 at 1300 Mac Davis Ln. 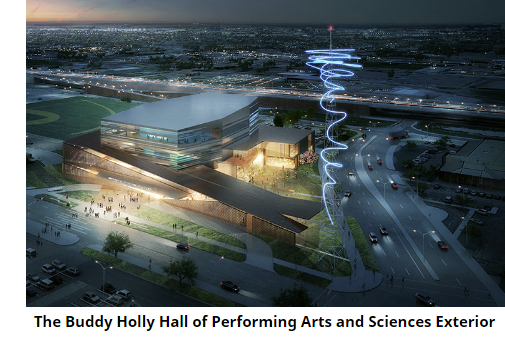 Buddy Holly Hall is designed to be a true performing arts campus, which will house a 22,000-sf ballet school, a bistro and the Lubbock Independent School District's (LISD) fine arts programs.